An important part of living well with dentures is learning how to eat and speak normally while wearing them. Once you’re accustomed to their feel and fit, you’ll enjoy all the benefits of affordable quality dentures such as speaking with increased confidence and eating the foods you love and may have previously avoided because of your missing teeth. If you just started wearing dentures, try to be patient. It takes a little time and practice, but soon your dentures will be helping you live a fuller life. Until then, the following tips may help. If pronouncing words with confidence is a challenge when you start wearing dentures, don’t worry; you’re not alone. It’s not unusual to have some minor speaking difficulties when you first start out. Many people have problems with words that start with the letters S and F. One way to gain confidence is to speak aloud when you’re alone. Try reading a newspaper article in front of a mirror. Another helpful trick is biting down and swallowing right before you start talking; this will set your dentures in place. At first, choosing soft and easy-to-chew foods like cheese, eggs, cooked vegetables, pudding, ice cream, and hot cereal can help you learn to eat normally. Take small bites and chew your food slowly. When possible, avoid biting down with your front teeth. Stay away from chewy foods like caramel, and don’t bite into hard candy or ice. Eating with dentures will feel different at first, but the process should become more comfortable in a few weeks. After three months, start adding more types of foods to your diet, including those that are harder to chew. 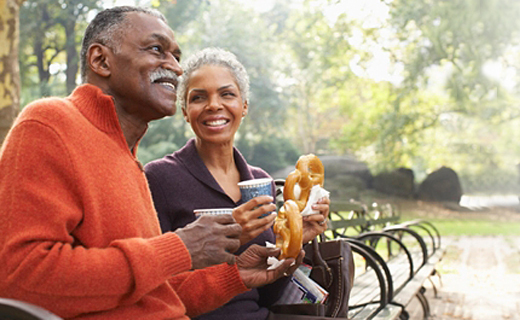 In time, both talking and eating with dentures will seem perfectly natural to you.